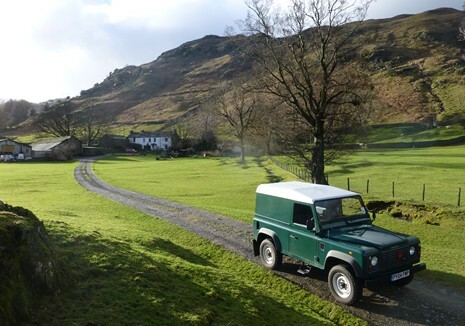 Deepdale Hall is located close to Patterdale and Brotherswater. Please follow the directions as below, or for Sat Nav use postcode CA11 0NR but then use the directions below as SatNav alone will not get you to us! Drive through Glenridding and Patterdale, leaving Patterdale and continuing towards Bridgend and Deepdale. You’ll see the sign to Deepdale Hall on the right hand side of the road about 1 mile after Patterdale. Follow the farm track for about a quarter of a mile and you’ll see the farmhouse up ahead. From Windermere take the Kirkstone Pass road (A592). Continue up the pass. After 6 miles you will reach the top and the Kirkstone Pass Inn on the right hand side, later on the descent you will pass Brotherswater on the left. Continue along this road passing the turn to Hartsop on your right. After approximately half a mile you will see the entrance to Deepdale on your left hand side, just passed the Red Phone Box. a Follow the farm track for about a quarter of a mile and you’ll see the farmhouse up ahead. There are regular bus services from Penrith to Patterdale all year round and from Windermere in the summer. There is also a good local taxi service M&A Private Hire, who will pick up from Penrith or Windermere if booked in advance.